A.C. Grayling’s latest, The Age of Genius. 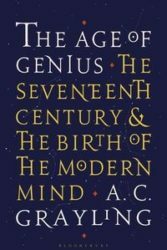 The Seventeenth Century and the Birth of the Modern Mind, is an odd book about a fascinating topic. The Age of Genius seems as ambitious and eccentric as any of Grayling’s undertakings, but finds itself undermined by exactly those qualities. It purports to argue that the scientific and intellectual advances in Europe between 1600 and 1700 were central to shaping the modern mind, more so than those made in other centuries, yet Grayling devotes the first third of the text to a history of the Thirty Years’ War. Although it is certainly true that the wars plaguing Europe between 1618 and 1648 served as a catalyst for the many great scientific, intellectual and philosophical innovations that came in the century’s second half, The Age of Genius fails to explain how war led to innovation – these connections are only ever implied. Although the notion that there were multiple enlightenments, reformations, and counterreformations has by now become commonplace, Grayling believes in the singular and the linear. Progress is real, the past really is a different country: in 1700, we no longer believe in magic and the occult, as they did in 1600, but rather in science and philosophy. In other words: in the seventeenth century, Europe became modern. This is a good thing, and The Age of Genius is to detail how it happened – sadly, for Grayling and the interested reader, it does not succeed in doing so. To be sure, Grayling’s century is important in the development of the Western world, also outside the realm of philosophy and science. The beginnings of the Western political system can be traced back to this period, for example, with the Peace of Westphalia (1648). Elsewhere, in literature and the arts, a new sensibility arises: in the Low Countries, Rembrandt, Hals and Vermeer lay the foundations for modern painting, Shakespeare’s plays eloquently articulate new ideas and Cervantes’ Don Quixote becomes the progenitor of a new literary genre, the novel. This is the legacy of the seventeenth century: a veritable leap in human history. Grayling mentions these aesthetic developments in passing, but his narrative is focused on science and philosophy, and it is told in fragments. Bacon, Hobbes, Descartes and Locke make sustained appearances, as do Kepler, Boyle and Newton. Several chapters detail these men’s achievements and the novelty of their ideas. These are interspersed with chapters on such issues as Dutch warfare innovations and – the best pages in the book – early modern postal services. Taken together, the reader does get an idea of how the seventeenth century evolved – but it is a cubist, rather than a realist vista. Grayling says he wants to give an account of how science, philosophy and reason advanced during the seventeenth century, but the chapters comprising The Age of Genius – which at times seem more like standalone essays – point in so many directions that this story frequently gets sidetracked. Ultimately, Grayling fails to clearly explain the relation between ‘his’ century and the periods that came before and after it. Without the Reformation and the Enlightenment, contemporary Western societies would not be the way they are today, but why Grayling prefers the era in between, he never makes clear. Is the modern mind thinkable without Petrarch and Kant, without Copernicus and Darwin, none of whom lived in the seventeenth century? Is it thinkable without the Renaissance’s re-appreciation of Latin and Ancient Greek sources? Without the philosophies of the major Enlightenment philosophers? Without evolutionary theory and the industrial revolution? Alternatively, what warrants their exclusion? Grayling seems intent on instilling rigid borders, but fails to justify why his particular set of borders is to be preferred over others. These are all stories that are missing from The Age of Genius. Yet they are not missing from history, and therefore subvert Grayling’s narrative. What is also missing is the wider world of the seventeenth century. The Low Countries appear in the book on account of their war against Spain, and their painters. There is no mention, however, of how Dutch captains, admirals and pirates attacked and took over many Portuguese and Spanish ships and captured trading posts in the Americas, Africa and Asia. Grayling omits Europe’s colonial activities during the period, thus ignoring a vast body of research stating that Europe entered modernity partially through its overseas conquests. Ideas are the drivers of change, Grayling contends, but how do ideas come into being? Surely, improved living conditions for the minds that develop these ideas are one part of it. Rembrandt could paint The Night Watch and his other masterpieces because, as the century progressed, Amsterdam merchants grew wealthier and wealthier, partially as a result of their income from plantations and the spice trade. Not all new Dutch wealth came from grain trade with the Baltic region, or from merchants fleeing the besieged Flemish provinces. The influx of wealth and ideas originating in the colonial experience shaped the seventeenth century to such a degree that Grayling’s failure to discuss it is a serious limitation of the book. In short, what is missing from The Age of Genius are the connections that link what happened in Europe in the seventeenth century to what happened before and after that century and elsewhere in the world during that century. Without such linkages any account of its scientific and intellectual advances, important though they were, remains lacking. Grayling’s claim has the potential to be convincing, and you would expect an author of Grayling’s stature to be able to make it so, but it would require a different book than The Age of Genius to prove it – one less Eurocentric, less limited in scope, and at the same time more organised.